Rudiger Dorn�s award winning pick-up and deliver game Istanbul and its expansions are getting the big box treatment from Alderac Entertainment Group on March 15. Dorn�s Istanbul has players working as merchants (and their assistants) in the bustling bazaar district of Istanbul. Players must fill wheelbarrows with goods at their warehouses and then have assistants transport them to various destinations. The game requires careful organization of the workforce, since they must be picked up and directed to their next task. The first to collect a certain number of rubies wins. Istanbul was awarded the 2014 Kennerspiel des Jahres (see �'Spiel des Jahres 2014' Winner Announced�) and has since spawned several expansions and a dice versions. 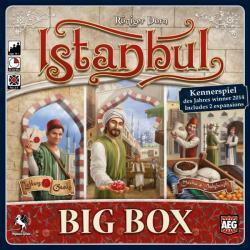 The Istanbul Big Box will include the base game as well as the Mocha & Baksheesh (see �Expansion for Kennerspiel Winner 'Istanbul'�) and Letters & Seals (see �Three New Alderac Titles�) expansions. The game is for 2 � 5 players, ages 14 and up, and plays in 40-80 minutes.